We’re currently in the second week of our honeymoon. Our first week was in Cyprus – we thought we might hire some bikes out, but as it was FIVE BILLION DEGREES…sod that! I’m writing this post from a B&B in Scotland, just a few miles out of Glentress, and goddamn, I wish we’d got two weeks here! Quite apart from the B&B being beautiful, with friendly owners, a friendly dog, and great breakfasts, Glentress is rather good for mountain biking, believe it or not. 😉 The entire area is beautiful, and the biking trails are a dream come true. Every trail I’ve done has been pure fun, even the green loops! The green loop is very gentle, but with some hairpin bends, and light undulation – a lot of fun when going at speed. It’s obscenely pretty, with a riot of purple and white foxgloves lining the route. The first part of the blue is a bit dull, as long uphill slogs always are (even with switchbacks), but once it gets going downhill…ruddy hell! Yesterday was a bit rough for me, as I went out without any of my precious ibuprofen. As regular readers may know, for me this is about as smart as when Icarus thought that getting a closer look at the sun was a good idea. Today, however, I went prepared, and had a great time (once I got up all the sodding hills). I felt a lot more confident and comfortable going down the blue today, and was tackling the drop-offs, berms and tabletops with ease. I got a little too confident, and decided to jump a table top. To my credit, I did get airbourne. Very airbourne. My smug grin turned to panic, however, as my feet came off the pedals, the bike started swinging sideways to the right, and the pedals smacked me in the knee . There are some people who actually do this as a stunt when they freeride. I’m not one of them. Luckily, I managed to swing the bike back, land in an upright postion, get my feet back on the pedals and carried on as if it was intentional…possibly even in that order. I had a small river of blood on my knee, but I felt strangely exhilarated. I got air and didn’t die! Anyhoo, that’s all from me for today, the internet connection is a bit slow here (using Mr Toast’s mobile as a modem), so I’ll add photos and the like when we get back. Well, we got married! 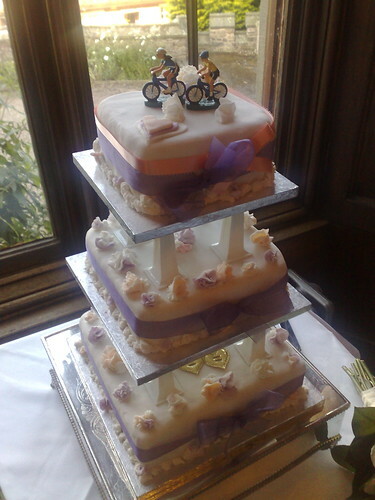 I didn’t realise how strong our reputation as a ‘biking couple’ was until it got mentioned in the groom’s speech, my brother’s speech (stepping in for my late dad) and the best man’s speech (who pointed out the first time he met me, I fell with great gusto when I hit a kerb – although he did point out that I just got straight back on again…thanks Jag!). We’re off on honeymoon on Wednesday – going to Cyprus for a week, then off to Glentress for a week of mountain biking. Who’d’ve thunk it? …Yeah, OK, so I said I wouldn’t do any more red route before the wedding, but surely a leetle bit of Follow the Dog couldn’t hurt? Well, I did all of FtD in about 1 hour 15 minutes, shaving 15 minutes off my previous best…and considering that when I started doing FtD this year, it was taking me two hours, I was well chuffed! I’m still not tremendously fast – the main improvement is not taking such long breaks between sections. However, any improvement is good, so…yar! It was a top ride to end my mountain biking career as an unmarried wench. Highlights: Getting halfway up the fire road hill before realising that I was in the middle ring instead of the granny ring, finishing the lap in record time. Bad bits: Flaking out at the top of the fire road hill. Damn thee, knees! Post ride food snaffled: Didnt actually eat anything at the café after the ride, as it was closed. Good dogs seen: Some good jack russells with high quality head to body ratios.